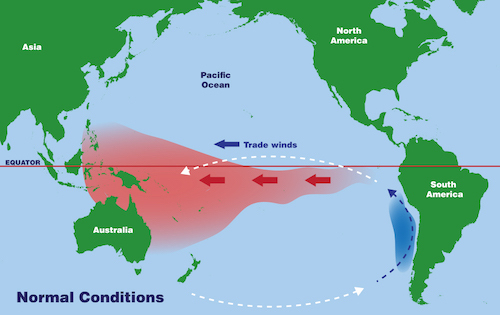 La Niña is a weather pattern that occurs in the Pacific Ocean. In this pattern, strong winds blow warm water at the ocean’s surface from South America to Indonesia. As the warm water moves west, cold water from the deep rises to the surface near the coast of South America. La Niña weather patterns can cause drier than average years in some regions of the United States. In those same regions, El Niño weather patterns can cause wetter than average years. You’ve probably heard your local weather forecaster talk about rain or storms caused by El Niño. But have you ever heard of La Niña? 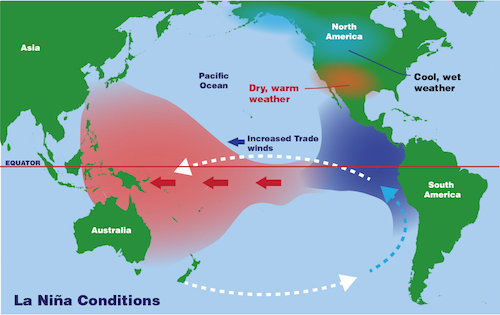 La Niña, like El Niño, is a weather pattern that can occur in the Pacific Ocean every few years. In a normal year, winds along the equator push warm water westward. Warm water at the surface of the ocean blows from South America to Indonesia. As the warm water moves west, cold water from the deep rises up to the surface. This cold water ends up on the coast of South America. In the winter of a La Niña year, these winds are much stronger than usual. This makes the water in the Pacific Ocean near the equator a few degrees colder than it usually is. Even this small change in the ocean’s temperature can affect weather all over the world. Rain clouds normally form over warm ocean water. La Niña blows all of this warm water to the western Pacific. This means that places like Indonesia and Australia can get much more rain than usual. However, the cold water in the eastern Pacific causes less rain clouds to form there. So, places like the southwestern United States can be much drier than usual. 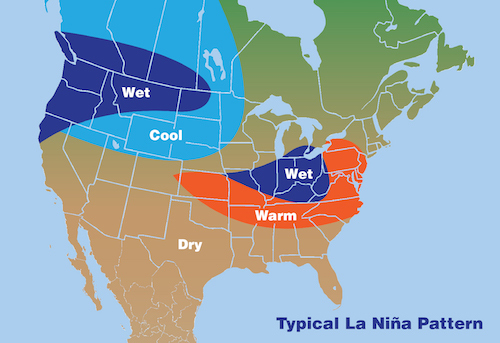 Typical La Niña weather patterns in the continental United States. La Niña is caused by an interaction between the Pacific Ocean and the atmosphere above. However, it can have effects on weather all over the world. These changes in the atmosphere can lead to more lightning activity within the Gulf of Mexico and along the Gulf Coast. Also, the environmental conditions during La Niña can lead to more tropical cyclones—which include hurricanes—forming in the deep tropics (near the islands in the Caribbean, for example). Thankfully, scientists can predict the El Niño and La Niña weather patterns up to a year before they occur. The GOES-R series of weather satellites can help weather forecasters map the increased lightning and issue earlier and more accurate severe weather warnings. What’s the difference between El Niño and La Niña? In Spanish, El Niño means “the little boy” and La Niña means “the little girl.” They are sort of like a brother and sister. 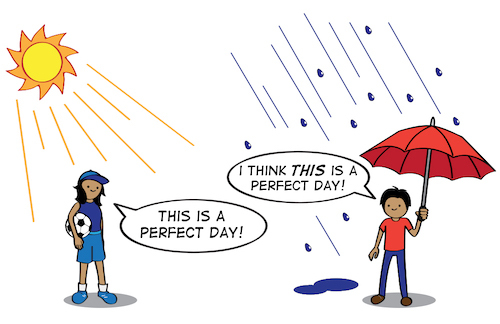 Like many siblings, the two weather patterns are opposites in almost every way. La Niña causes water in the eastern Pacific to be colder than usual. In the same region, El Niño can cause the water to be warmer than usual. Areas that are hit with drought during La Niña years are pummeled with rain in El Niño years. Unlike a brother and sister, El Niño and La Niña might not be related. A La Niña year usually happens a year or two after an El Niño year. However, scientists don’t think that a La Niña is always caused by an El Niño.